Sunrise has designed a new poker machine platform under contract to Global Gaming Industries, for their "Global Series" poker machine range. 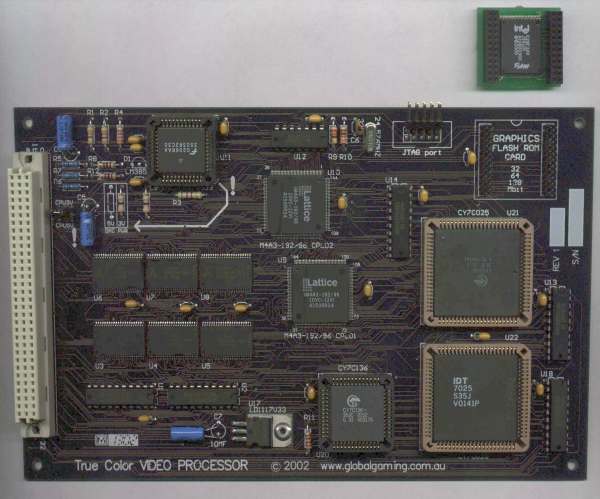 The picture shows the video processor PCB. Dual processor board for controlling all game and communication functions. Custom designed True Color VGA graphics adapter with poker machine specific hardware acceleration functions, implemented in CPLD's. Jurisdiction specific serial port board for central monitoring, link progressive and cashless credit transfers. Digitised sound effects and stereo amplifier. On board switchmode power supply to allow the logic circuits to be powered directly from the system 24vDC supply. Sunrise Micro continues to manufacture the set of boards for Global Gaming Industries. Note: This information is included to illustrate our design and manufacturing capabilities. IP ownership of this product is assigned to Global Gaming Industries. Link to Global Gaming Industries' web site.